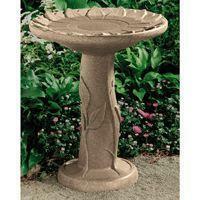 A bird bath makes a great centerpiece for a backyard or garden. 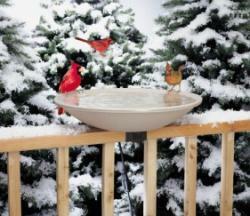 A fountain bird bath adds the soothing sounds of flowing water to your yard, while a heated bird bath keeps birds cozy during the winter. A bird bath is easy to maintain and requires only 2-3 inches of water, as birds but don’t completely submerge themselves but just dip their wings while bathing. 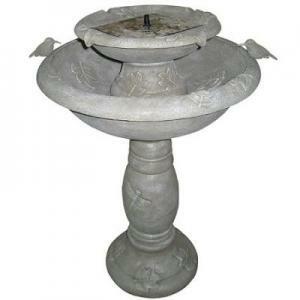 We offer bird baths made of a wide range of material, from ceramic to stone to acrylic--so regardless of your taste, we have the bird bath for you. 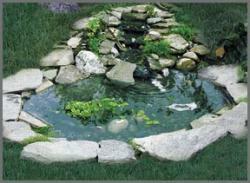 In addition, each bird bath we sell is backed by a 100% money-back guarantee, ensuring that you’ll find the perfect bird bath for you backyard. How to Make Your Backyard a Bird's Paradise - Here are five easy ways you can get wild birds into your backyard. Top 10 Most Desired Backyard Birds - Everyone loves when a bird comes into their backyard for bite to eat. However, this is a list of those birds you'd love to come around more often. How To Stop A Bird From Pecking At Your Window - When birds see themselves in windows, they are usually alarmed and peck at the reflection in the glass for several minutes. 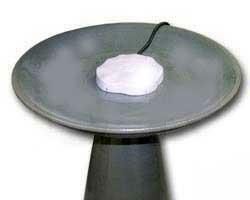 If you have this problem, here are some solutions to deter birds from pecking at your window. How to Attract Rose-Breasted Grosbeaks - For residents in the eastern half of the United States, the Rose-Breasted Grosbeak is one of the most attractive and desired backyard birds. If you'd like to lure this bird to your yard, here's some advice to keep in mind. How To Care For A Fallen Baby Bird - Whether by accident or by design, baby birds sometimes fall out of nests and land helplessly on the ground. If you you find one of these fallen baby birds, here are some things you should do to help it. Tips For Birding At Night - Night birding helps you spot a variety of new species that only come out at night, like the Great Horned Owl or the Night Heron. If you're planning on going birding at night, here are some tips to keep in mind. How To Protect Your Birdhouse from Cats - Domestic and feral house cats kill about 500 million birds a year, which is why it's extremely important to protect your birdhouse, feeder and nesting boxes from predators. 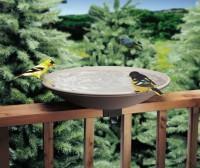 Make protecting your backyard birds a priority by following these tips. How to prevent birds from hitting windows - The number one cause of unnatural bird deaths in the United States is birds flying into windows. If you're interested in preventing birds from flying into your windows, here are a few easy steps you can take. How To Attract Robins To Your Yard - The American Robin is a beautiful bird that has a wide range spanning most of the United States. If you'd like a robin to feed or nest in your yard, here a few tips to help attract them.